Fresh starts. New adventures. The whole unexplored landscape that is the year ahead. I welcome January, when anything seems possible. Except, of course, when there’s transition week. Anyone else having a transition week? Come on, you know you are. I can see it in my son as he struggles to get back in synch with the school schedule. (And not just him; it was tough to return to the early morning, make breakfast, pack lunch, check homework hustle). I can see it in other kids at school as they squirm in their seats during reading or space out during lessons. I can feel it in myself as I scramble to set up work systems for the year, finish writing projects that didn’t quite get squared away before the holidays, and pitch new stories for 2010. All in a week when the Los Angeles Times reports that the freelance writer’s life is in dire straits. But right now, just for today, I refuse to give in to doom, gloom, and ennui. It’s a new year. Ripe with potential. Let’s begin at the beginning. 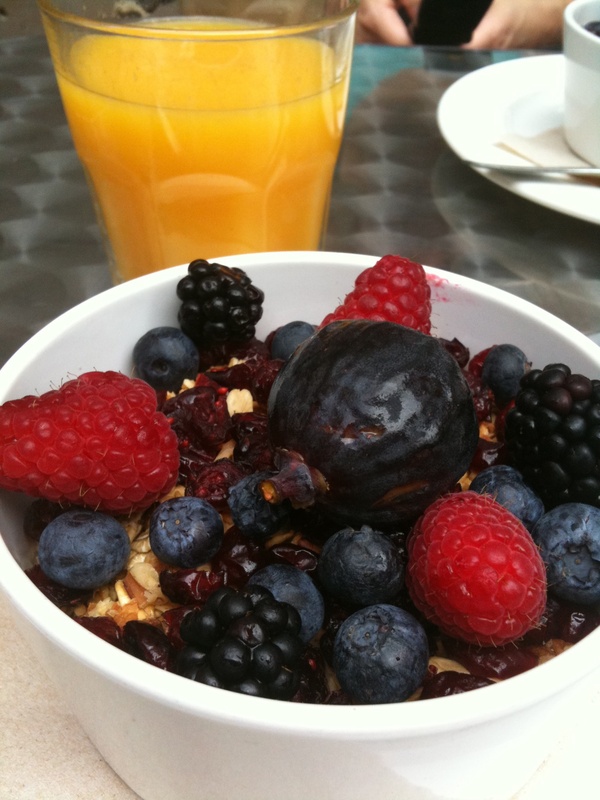 And where else to start but breakfast, that first meal of the day? I’m a big fan of brekkie, though I’ve yet to embrace the au courant trend of eating lunch or dinner foods first thing in the morning. Good luck to all those folks who chow down on pho, pizza, or korean barbecue for breakfast, that stuff leaves me cold when I’m still shuffling around in my slippers. For my money, granola makes a great early morning, gotta-hightail-it-out of the house breakfast. Discovering granola after growing up with sawdusty muesli ranks high on my list of culinary discoveries in my move from Sydney to San Francisco. Some sniff that granola is just a fat-, calorie-, sugar-laden treat, but it’s got serious hippie pedigree: old-fashioned oats, nuts, and dried fruit, along with maple syrup or honey and oil or butter. Of the grocery store granola offerings, I’m partial to local, handmade, unfussy Cafe Fanny Granola, and Partners Gourmet Multigrain Granola, which comes in toasty chunks of nutty-grainy goodness. My boy likes the Arrowhead Mills Breadshop Organic Vermont Maple Granola and, ever since I attended a granola tasting hosted by 18 Reasons, he’s become obsessed with the exxy and excellent 18 Rabbits Gracious Granola with pecans, coconut, and pumpkin seeds. (It was one of his fav stocking stuffers.) He likes to fix a bowl for dessert. 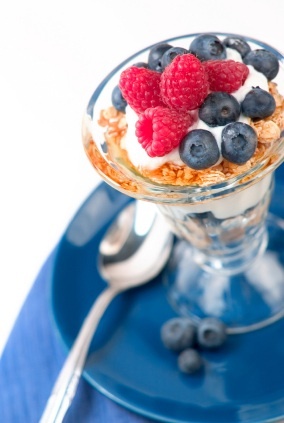 In our house, we prefer our granola served with yogurt; it makes for a pretty parfait, layered in a long glass with berries adding visual zing along with vitamins. And while some cafes serve their granola sprinkled on top of a generous mound of yogurt, we like to layer granola, yogurt, and fruit in equal measures. How ’bout you? Everyone’s got an opinion about the best tasting granola on the market; for a comparison of other commercial brands check out this Serious Eats review. And feel free to let me know yours. Truth is, though, it’s easy and cheaper to make your own granola and custom it to suit your palate. You can often significantly lower the amount of sweetener in recipes, I’ve found, without sacrificing flavor. When I’m not feeling lazy, I make the Crunchy Fruity Granola from Mollie Katzen‘s Salad People cookbook, a simple, satisfying recipe popular with kids in the cooking classes I’ve taught. Recently, I sampled a delicious batch of granola, recipe to follow. But first, the back story. I am fortunate to have a good friend, also a fellow freelancer, who covers the travel beat. Specifically, healthy, eco-travel on her blog Health * Conscious * Travel, mostly geographically centered in the Wine Country. To do her job, my pal Melanie Haiken has the tiresome task of checking out high-end spas and resorts which she then writes about for her readers. Someone has to do it, right? She visits said spas and resorts as a perk of the profession, and she’s often invited to bring a guest, known in the biz as a “plus one”. Do you know how delightful it is to be the plus-one person? You enjoy all the facilities without having to take the hard-hat tours or copious notes. And, if you’re lucky, you might eat some very good granola. That’s exactly what happened recently when we stayed at the ultra-sleek Hotel Healdsburg, where we enjoyed a room with a super groovy green-tiled bathroom and — full disclosure coming — a comped breakfast that included granola that made us both happy. It’s concocted by the chefs at the Dry Creek Kitchen, adjacent to the hotel. They graciously agreed to give me their recipe so I’m sharing the swag with my readers. It’s very moreish. As in you’ll want to eat more of it. Trust me. Let me know if you agree — or if you have your own granola recipe you want to add to the mix. Enjoy. 1. Combine first 8 ingredients in a bowl. 2. Melt brown sugar, honey, butter & maple syrup in a pot. 3. Mix until well combined. 4. Pour over dry ingredients and toss until everything is coated. 5. Spray a sheet tray with non-stick coating. 6. Spread granola evenly on sheet tray. 7. Bake at 300 degrees F for approximately 30 min. 8. Toss granola every 10 min. 9. Bake until golden brown and all moisture has evaporated. 10. 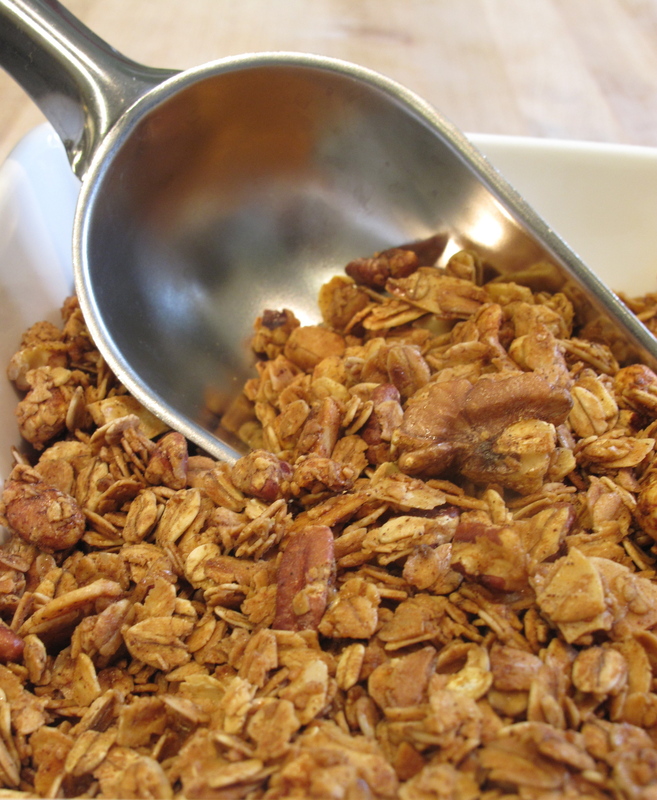 Continue to toss granola as it cools to avoid large clumps. How many of you have found those email chain letters in your inbox asking you to share a recipe with a dozen or so others? How many of you actually respond? I’m not entirely sure why, but I never seem to reply to these recipe requests (sorry Anne, Katherine, Ellen, et al.) and wind up feeling a bit guilty about it. Maybe they’re too much pressure — you feel the need to cast around for the perfect dish to share with the masses. Maybe it feels too time consuming and thus goes into the to-do list, and then too much time passes or you forget…Who knows. I suspect many of them are generated by busy working parents (mostly moms), who want help with that perennial post-work-school-pick- up-race-to-martial arts/dance class/soccer-hustle and the inevitable, ravenous question: “What’s for dinner? '” as soon as you walk in the door. It’s hard to resist the urge to say something snippy like “What are you cooking?” or even “Who the hell knows?” but that won’t get dinner on the table. And when time is short, you’re hardly about to start browsing through your library of cookbooks for inspiration. But what if you took a few minutes out of your day to check out a couple of online recipe resources. That sounds doable, right? So in the spirit of sharing recipes via the ‘net (if not email) I offer web links to click to find nutritious & delicious dishes you can fix for your family in a timely fashion. No doubt you’ll have your own bookmarked recipe links you’ll want to share. Feel free. As for those recipe exchange emails…okay, alright, already, I’ll reply…maybe there’s a blog post in what happens after I hit send. Simply Recipes Elise Bauer’s six-year-old, award-winning web blog is chock full of easy-to-fix, healthy suggestions for family meals. The site is easy to navigate, the recipes easy to follow, and it’s easy on the eyes as well, with lots of lovely photos. 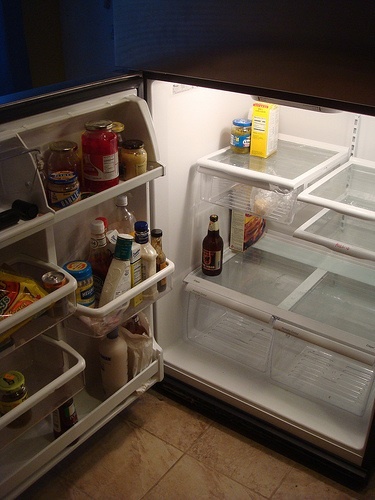 Browse categories that meet your family’s needs, whether budget, vegetarian, or gluten free. Try Spinach Frittata, Enchiladas, or Sauteed Swiss Chard Ribs with Cream and Pasta. 101 Cookbooks Heidi Swanson, author of Super Natural Cooking, serves up evocative images of wholesome vegetarian offerings on this much-lauded site, started as a way to work through recipes in the vast number of cookbooks Swanson had amassed at home. This blog is a snap to get around too. Consider Lemony Chickpea Stir-fry, Broccoli Cheddar Soup, or Carrot, Dill and White Bean Salad. Tasty Kitchen The brainchild of the hilarious blogger Ree Drummond, aka as The Pioneer Woman, a self-described spoiled city gal who left the urban life to marry a cattle man and homeschool four children, Tasty Kitchen is a recently launched site for home cooks to share their favorite recipes. Good place to park those email recipe exchanges, maybe? Check out Pumpkin and Pear Soup, Ratatouille, and California Style Sushi Rolls. Supercook is a cool newish web tool equipped with a search engine that helps you prepare meals with the ingredients you have on hand. Just plug in what you have in your pantry, say rice and lentils, and within seconds you’ll get a recipe or maybe several from its database of 300,000 and growing. You can comment on whether you like or dislike a dish and even add your own to the mix. Another potential home for those avid recipe exchangers! Named by Time.com as one of the 50 best websites for 2009. Will Write for Food Speaking of bests, several “best food blogs” lists are worth perusing when you’ve got a little more time to surf around to find a recipe resource that appeals. My pal Dianne Jacob over at WW4F has gathered links to five of these best ofs in one place. The website delish also keeps a comprehensive list. Check back for a future post when I finally put together my very own favorite foodie bloggas blogroll. Flickr photo by dcdan used under the Creative Commons license. Dudley’s Rhythm & Motion dance class on Sunday. Yogurt, granola, and berries for breakfast — topped off with a fig, no less — from around the corner at the architecturally splendid Stable Cafe, once the site of the San Francisco mayor’s carriage house in the 1800s, now adding some sparkle to an otherwise scruffy stretch of Folsom Street. It’s the simple pleasures — dancing with the same community of movers & shakers for more than two decades, sharing a healthy breakfast with a friend (Beth’s line of the day: “Don’t you just love it when you crave a food that’s good for you?”), and enjoying eating outside in some sunshine after stormy weather — that make life grand. Don’t you think? 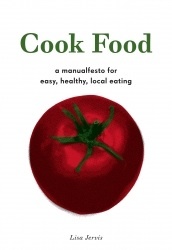 Perhaps the best thing about Cook Food: a manualfesto for easy, healthy, local eating is that it’s a slim little volume. That’s not some snarky reviewer comment. Writer Lisa Jervis aims to demystify how to eat well and cook simple food by keeping her book brief. She includes 20 recipes of the beans, greens, grains, tofu, and tempeh variety. Well seasoned, as Jervis advocates, these ingredients can form the basis of a decent recipe repertoire for the eco-conscious (both environmental and financial). Regardless, if Jervis, who sports a cool beet tattoo, happens to be reading in your neighborhood do stop by. At The Green Arcade bookstore in San Francisco last Friday, it feels like I’ve entered the kitchen of a friend who could use a little help getting the dinner on. More group discussion and less book reading, Jervis distractedly composes a farmers’ market salad for her audience to sample to support her thesis that preparing satisfying food is within everyone’s reach. She fields questions while she chops. We learn she’s politically aware (conscious of her carbon footprint, locavore advocate, mostly vegan), and a bit of a renegade (a liberal user of oil and salt, she signs her book, salt early, salt often). 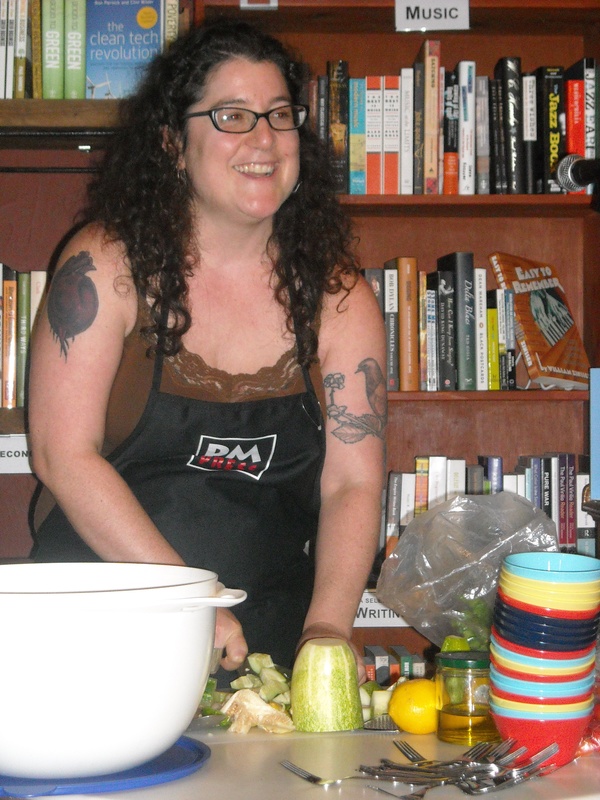 She also confesses during her cooking demo that she’s confused an Asian melon for a lemon cucumber. It doesn’t seem to faze her. There’s nothing slick going on here, which leaves you feeling comfortable that you, too, can cook food. In this era of celebrity chefs and network cooking shows, it’s easy to feel intimidated by food. Jervis serves as a reminder that we don’t need to be. Would you attend a free cooking class if your child’s school offered one? The good folks who run the cooking and gardening programs in my kid’s school district provide five-week parent nutrition classes in the spring. The evening program reinforces instruction about healthy eating these parents’ children receive at public school — and helps time-challenged adults expand their recipe repertoire. The classes emphasize local, seasonable, and organic produce and whole grains. It’s a great idea. Who among us hasn’t fallen into a rut serving our family the same dozen or so dishes we have down pat and know our kids will eat? We stock our pantries with familiar ingredients so we can make these staples in a jiffy after the work-school-pick-up-soccer-practice shuffle. The very nature of our busy lives can make it tough to steal away from our families to attend night school, even if its purpose is to help us feed our families better. And yet a small but eager group showed up a week or so ago to the first class I taught. Asked what they hoped to take away from the sessions each participant placed fresh ideas for healthy meals at the top of their list. Truth be told, I felt a tad nervous about getting up in front of a group of adults and waxing on about the wonders of fruits & veggies. Sure, I’ve taught kids cooking classes. But I live in Berkeley, California, aka the Gourmet Ghetto. Some parents at our school run highly-acclaimed restaurants in the community. I’m just a home cook with a passion for produce. Indeed, several of the parents who showed up that first Thursday night clearly knew a thing or two about cooking. Still, everyone seemed willing to share what they know for the common cause of feeding our children well. And it turned out that in our initial class, focused on simple salads, most folks found something new. A couple of participants made vinaigrette for the first time — and were delighted to discover how easy it is to do. One mom learned about zesting and how to incorporate this technique to add a little zing to her kitchen cuisine. And all but one of the assembled crew were new to the nutritional powerhouse quinoa. I’m a huge fan of this pearly little protein-packed, grain-like seed, which makes a great alternative to rice or couscous, and also works well in salads or as breakfast cereal. It’s fiber-rich, gluten-free, and helps keep blood sugar levels in check. Quinoa (pronounced keen-wah) an ancient Incan food and a key staple in South American cuisine, is becoming more widely available in grocery stores and increasingly showing up on restaurant menus as well. I can still recall the first quinoa salad I sampled at the Station House Cafe in Point Reyes Station, a favorite coastal walking destination. Light, crisp, and colorful, the quinoa served as a nutty, fluffy, and satiating base for my post-hike feast. The quinoa salad we made in class is quick to fix and easy to tweak. (Your kid doesn’t like apricots? Simply omit. No parsley on hand? Cilantro works just as well in the dressing.) It proved a big hit on the night. Maybe you’ll find a way to work it into your menu schedule some time soon. Good to Know: Some folks swear by rubbing the quinoa grains together to activate or energize them. Some also advocate toasting quinoa seeds over dry heat to increase their nutty flavor. Others say soaking quinoa for several hours or overnight improves nutrient absorption. Handy Hint: Time may factor into whether you try any of the above. Regardless, do rinse quinoa thoroughly in cold water and drain in a fine sieve before cooking to remove a naturally-occurring protective coating called saponin, which can leave a bitter or soapy aftertaste. 1. Bring water to boil then add quinoa and salt. 2. Cover and let boil for 5 minutes. 3. Turn off heat and keep lid covered another 15-20 minutes or until all water is absorbed into grain. 4. Fluff up grain with a spoon. 5. Make dressing: Combine lemon juice and zest, oil, parsley, spices, and salt in a small bowl and whisk together. 6. Mix quinoa, dried apricots, currants, red pepper, scallions, and pine nuts with vinaigrette. 7. Serve as a side dish. Recent convert to quinoa? Find more tempting recipes here.